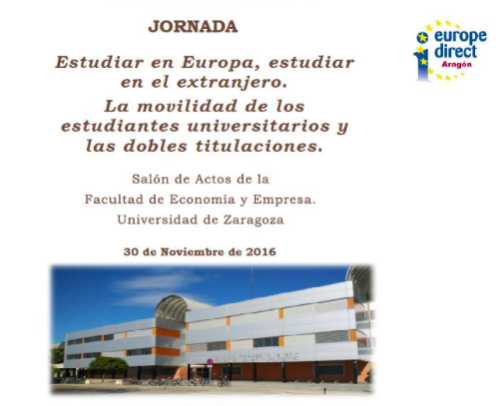 The University of Zaragoza organized a conference on internationalization where joint degrees and double degrees were the main topics of discussion. In this forum, institutional and faculty members agreed on the importance of creating a space where it is possible to share and discuss the university’s internationalization objectives and the different strategies that can be used to achieve these goals. Debates on legal regulation, funds, quality assurance of higher education, joint degrees, the Iberus international campus and mobility in undergraduate and graduate programs were key to the discussion. Furthermore, we had the opportunity to listen to the experiences the University of Granada and the Universidad Autónoma de Madrid have with joint degrees before the presentation of some local practices at the University of Zaragoza. Most of the joint degrees presented took place in the Faculties of Science, Engineering, and Economics with French and German universities. Joint and double programs are becoming a frequent strategy in the pursuit of internationalization, but always bearing in mind the added value and quality they can bring to the degree and the students.